Baviaria, considered by many as the most spectacular and beautiful state in Germany, has as its capital city, stunning Munich, (in German, Munchen), a very international and cosmopolitian city, known for its architectural beauty and its warm and friendly people. It has a long history and the name of the city comes from the Old High German term Munichen which means "by the monks." The name derives from the monks of the Benedictine order who ran a monastery at the place that later became the Old Town of Munich. Munich lies on the River Isar just north of the Bavarian Alps and is the entrance to those breathtaking Alps with all the wonderful winter sports, castles, and charming picturesque towns and villages. It is the third largest city in Germany after Berlin and Hamburg, and it boasts a population of approximately 1.47 million. 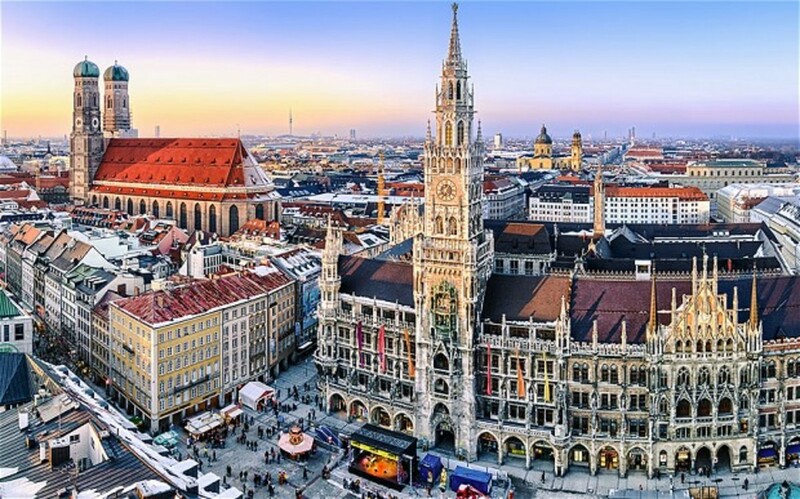 Munich was first mentioned in historical documents and records as early as 1158 AD and from the year 1255, Munich has been the seat of Bavarian Dukes. Black and gold are the city's traditional colors which were the colors of the Holy Roman Empire under which it was once ruled. These have been the city's official colors since the time of King Ludwig I, when Munich was an imperial residence. Munich was the capital of all of Germany in 1506, but today the capital city of Germany is Berlin. Surprisingly, the people of Munich are traditionally of the Catholic religion as is all of Bavaria, but it was the stronghold of the Counter-Reformation and and a point of divergence during the resulting Thirty Year's War. During that long war it remained Catholic even though for a time it was occupied by the Protestant Swedes. Once a duchy's capital, it evolved into that of an electorate in 1623, and later into a sovereign kingdom. 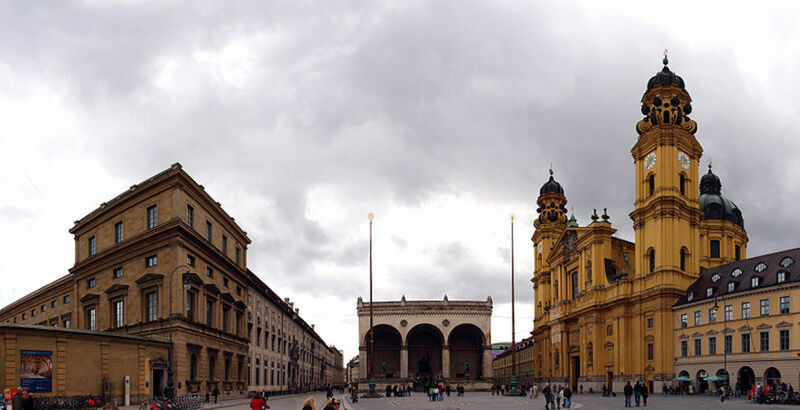 Munich has been the center of arts, culture and science for Germany since the early 19th century. During the Nazi movement in Germany, Munich became the notorious Hauptstadt der Bewegung, the capital in Germany of the Nazi movement, the darkest time in its history. 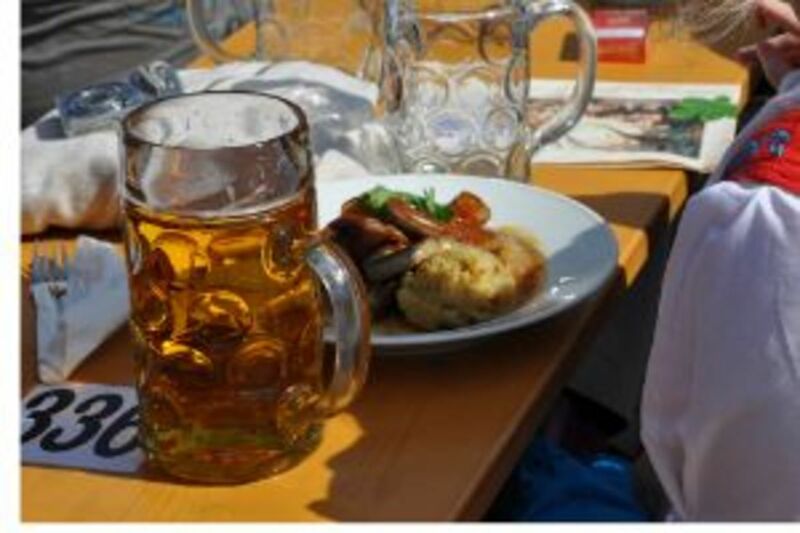 It is also famous for the annual Oktoberfest which attracts tourists from all over the world who converge on Munich to celebrate the bier or beer and food for which Germany is so famous. In 1972 its was the host city of the Summer Olympics which sadly has the dark mark of the assassination of the Israeli Olympic athletes by a Palestinian terror group. By 2013, though, it was rated the world's most livable city with the highest quality of life. I would have to agree with that assessment as I have visited the city several times. 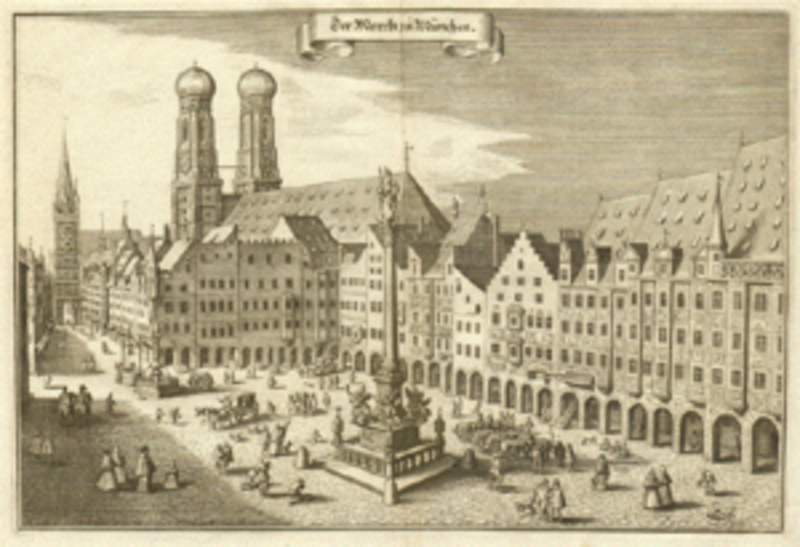 Munich's origin began as a medieval town and is first mentioned in historical records and documents in the year 1158. At that time it became the seat of Guelph Henry, the Lion, Duke of Saxony and Bavaria. By the year 1175, Munich was officially granted city status and received fortification. In 1180, Otto I Wittelsbach became the Duke of Bavaria and he handed Munich over to the Bishop of Feising to head. The Wittelsbach Dynasty would rule Bavaria until 1918, the end of WWI. In 1240, Munich transferred to Otto II Wittelsbach, and in 1255 when the Duchy of Bavaria was split in two, Munich became the ducal residence of Upper Bavaria. By 1506, Bavaria was again united and Munich became its capital city and has remained so to present day. In 1468, Munich's largest gothic church, now a cathedral, the Frauenkirche was begun construction. It is still standing today and is a famous and popular tourist stop in the city. In the 16th century, Munich became the center of the German Counter-Reformation and also an important city of the Northern Renaissance arts. In 1589, the now famous and popular Hofbrauhaus was built on the Marienplatz (the Old Town center) and it became the brewery for brown beer. The Bubonic plague (Black Death) hit the city around 1634 and one-third of the population of Munich was killed off by the plague. 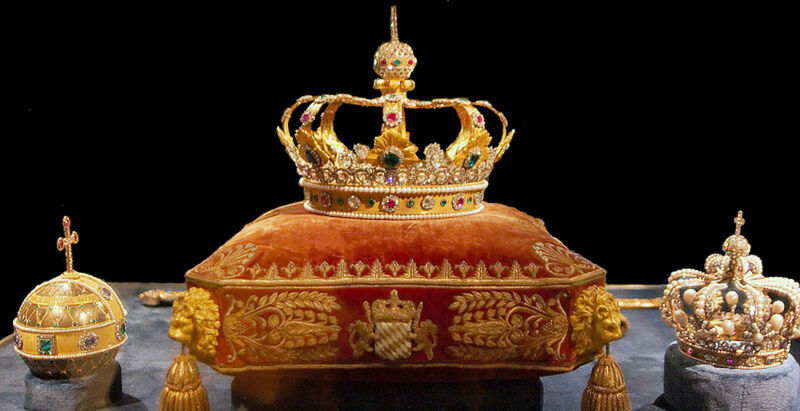 During its colorful history it was also ruled by Sweden and the Hapsburg dynasty. 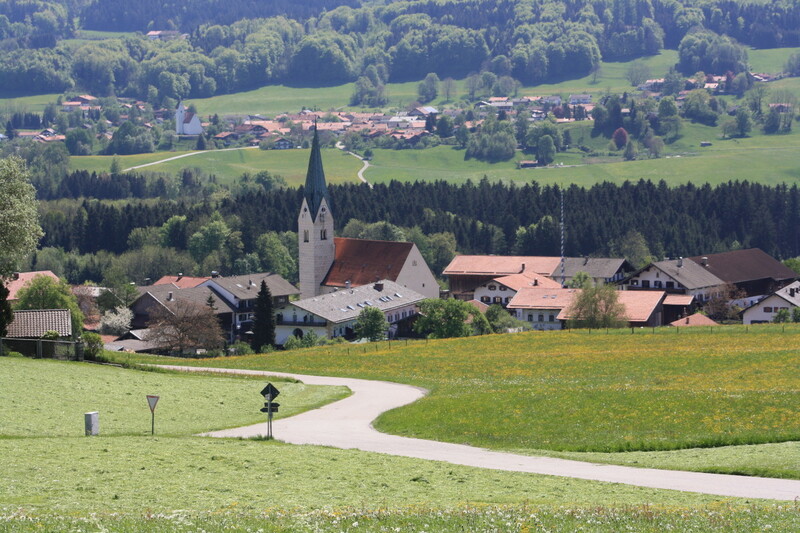 In 1806 the city became the capital of the new kingdom of Bavaria and has remained so to today. During WWI (1914) Munich was blockaded and bombed three times by the French (1916). After WWI, Munich became the center of much political unrest and chaos. On the eve of revolution (November 1918) King Ludwig III and his family fled the city. In 1919, the Bavarian Soviet Republic proclaimed Munich under Communist control. Fortunately, the Soviet Republic ended on May 3, 1919 and they were driven out by the Freikorps. A republican government was restored, but Munich continued to experienced unrest and extremist politics. Adolf Hitler took advantage of this political unrest and this is where he and his National Socialist Party got their start and rose to prominence and power. In 1923, Hitler and his supporters staged the Beer Hall Putsch, an attempt to overthrow the Weimar Republic and seize power. The attempt failed and Hitler was arrested and imprisoned. This disabled the Nazi Party as they were virtually unknown to the rest of Germany. However, when the National Socialists took power in Germany in 1933, Munich once again became a Nazi stronghold. This was when the National Socialist Workers Party created their first concentration camp, Dachau, ten miles (6 km) northwest of Munich. At first it was a concentration camp for criminals and communists, but later became a camp for the Jewish also. Munich was heavily bombed and damaged by allied bombing during WWII. There were approximately 71 air raids over a five year period. Following the U.S. occupation of Munich in 1945, the city was completely rebuilt and it preserved its pre-war street grid. It worked hard to recover after WWII and the postwar years were at first lean and difficult. Munich, again came to the world's attention when the 1972 Summer Olympics held there became marred b y tragedy. The Israeli Olympic athletes were assassinated by the Palestinian "Black September" terror group who took them hostage and then massacred them. Again, Munich, ever resilient, recovered from the tragedy to become a thriving economy and has become the world leaders in information technology, biotechnology and the publishing industry. * Does history repeat itself in Russia's confiscation of the Crimea and their encroaching into Ukraine, which the rest of the world has allowed? Whether you arrive in Munich by air, train, bus or car you enter into a lovely architectural city with an Old Town that is the original medieval town and a new very cosmopolitan and modern section of the city. 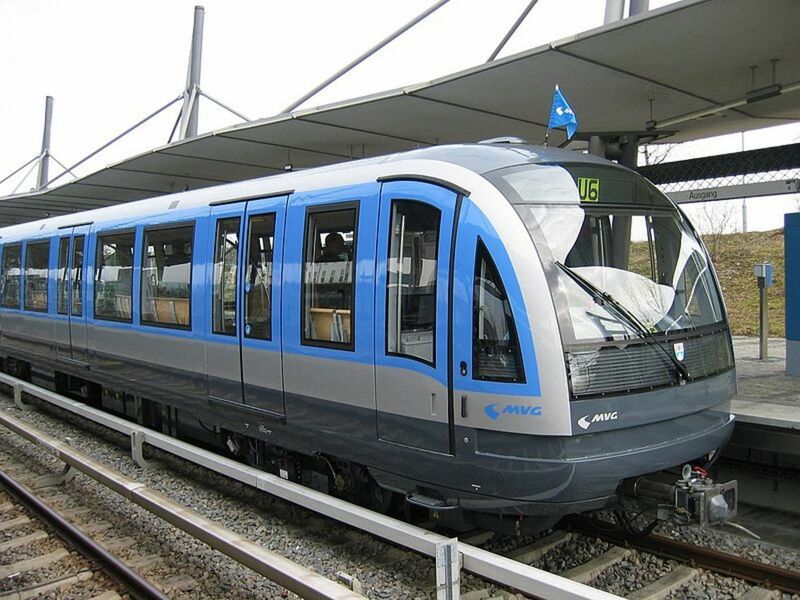 It is easy to get around Munich and the environs because of the beautiful and well-run U-ban (subway) so it is not necessary to have a car to visit and see this marvelous city. The first place to see and to get yourself acclimated to the city is the Marienplatz, which is the center square of the Old Town. It is a large open square named after Mariensaule and has a Marian column in its center. In the Marienplatz tourists can see the Old and New Town Halls. 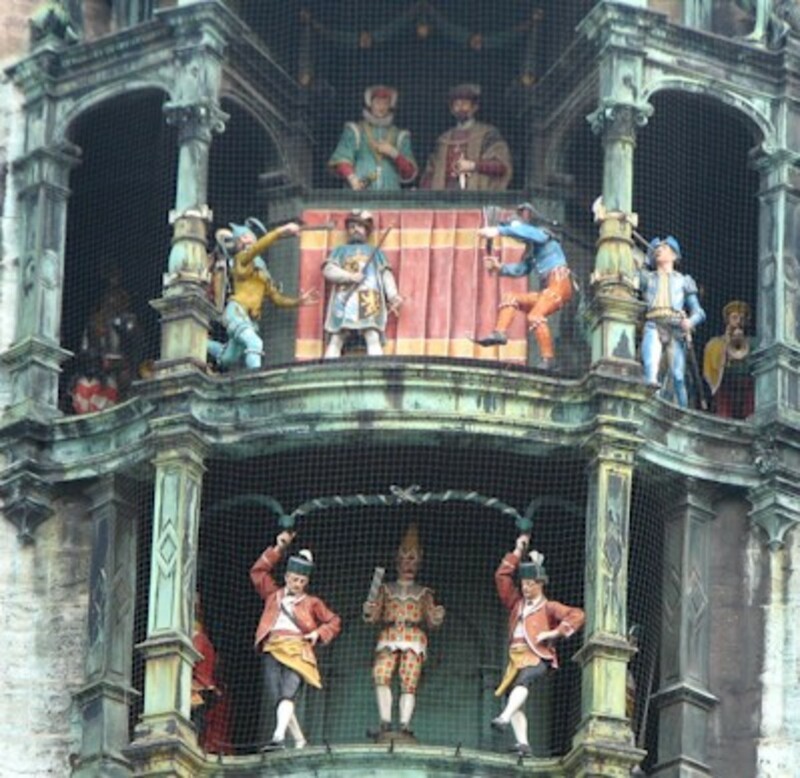 The charming Rathaus (mayor's building) has a tower in which the enchanting and charming Glockenspiel is on display to all those in the city. Its enchanting medieval characters dance around the tower every hour on the hour as the clock also chimes the hour of the day and night. This is the big draw in the Marienplatz and everyone who comes to Munich never misses this. Also on the Marienplatz is the Hofbrauhaus am Platzl, the most famous beer hall worldwide. 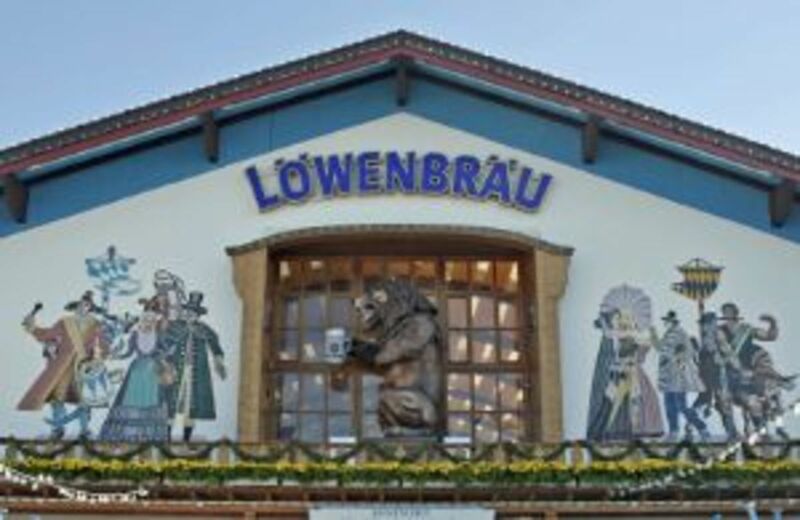 Here you can try the different Bavarian beers from light colored to very dark. Also, typical German food is served from Schweinschnitzl to all the different types of Wurst, German pretzels, and German potato salad. There is always German music, song and dance and this is a place not to be missed while in Munich. Peterskirche is just off the Marienplatz and is the oldest church in the inner city and was built during the Romanesque period. Viktualienmarkt is the most popular fresh vegetable, meat, and food market in the Old Town. The Residenz palace complex is located on the edge of Munich's Old Town and ranks among Europe's most significant museums of interior decoration. It also contains the treasury and rococo Cuvilliers Theatre. The Residenz palaces in the major cities in Germany were built for the bishop / archbishop that ruled the cities during medieval times and throughout German history. Then, they became the city palaces of the kings of Bavaria. The Hofgarten is located near the Residenz in the city's oldest park and is the largest Biergarten in Old Town. The National Theatre is a neo-classical opera house located next door to the Residenz. 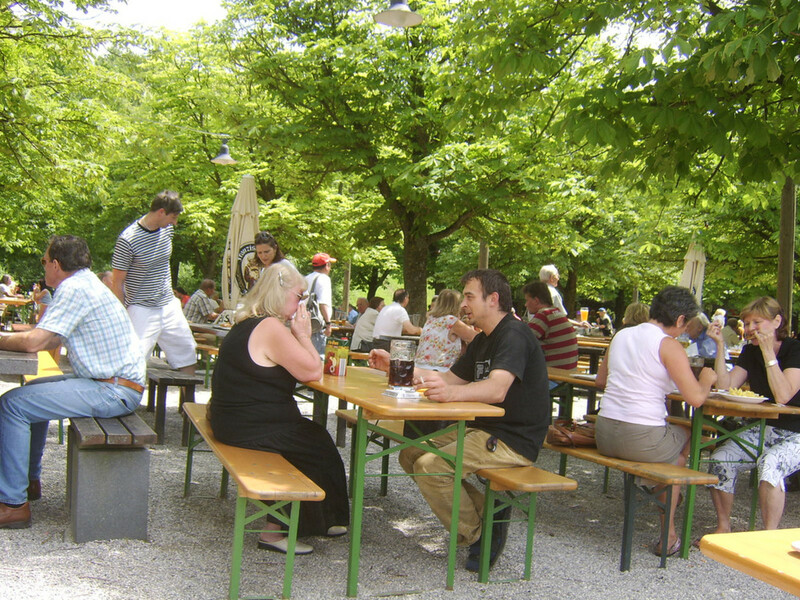 Englischer Garten is a garden close to the city center and covers 3.7 km (1.4 sq. mi) which is larger than Central Park in NYC. 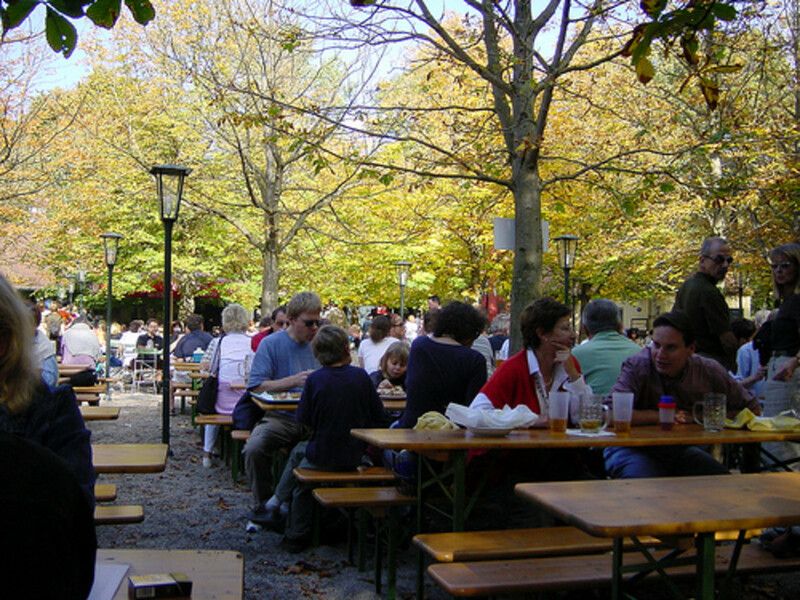 It offers many lakes and biergartens. It is one of the world's largest urban public parks and even contains a nudist area. 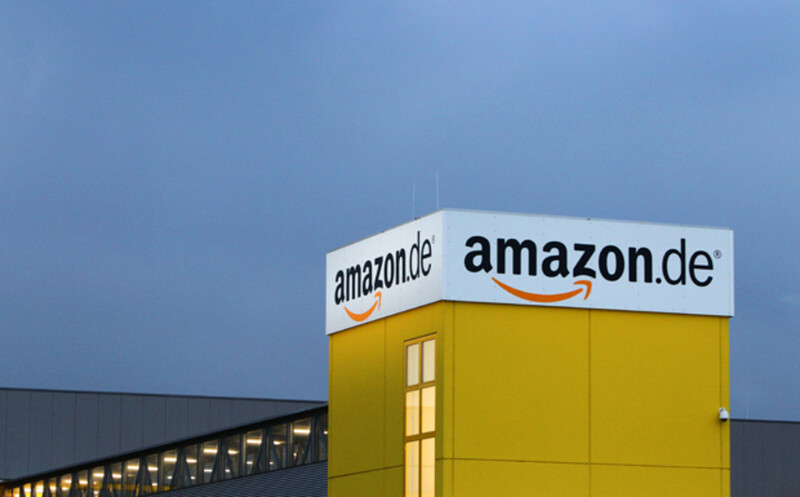 There are great shopping areas in Munich; Neuhauser Strasse, Kaufinger Strasse and Maximilianstrasse all offer shopping. The Olympic area of the 1972 Olympics were built in Munich's former airport, Oberwiesenfeld, and a beautiful ride is available to the top of Olympic Tower where magnificent views of the city and even the Bavarian Alps can be seen on clear days. Four grand avenues built in the 19th century with the beautiful architecture of official buildings connect Munich's inner city with the suburbs: Briennerstrasse begins at Odeonsplatz and runs east to west into Konigsplatz which is home to Munich's art gallery and museum quarter; Ludwigstrasse also begins at Odeonsplatz and runs south to north and boasts architecture of both the Italian Renaissance style and by the Italian Romanesque style; Maximilianstrasse begins at Max-Joseph-Platz and runs west to east and boasts designer shops, luxury boutiques and jewellery stores; Prinzregentenstrasse begins at Prinz-Carl-Platz and runs parallel to Maximilianstrasse. It boasts many museums and even Villastuck, Hitler's old apartment on this street. Munich is not to be missed if you are visiting Germany and if you can only see one city in Germany this is the one I would choose. There is so much of the traditional Germany we are familiar with, the costumes, the food, the beer, the music and songs and if you are there over Christmas the Cristkindelmarkt which features all kinds of Christmas ornaments and gifts and gluwein, traditional hot spiced wine. Some of the traditional regional food found in Munich is delicious and should not be missed. Germans eat three meals a day, breakfast, lunch, and dinner, as we do here in the U.S. In fact, it is from Germany we get our eating habits. German main dishes are tasty and hearty. There is the tender Weisswirst (white sausage) that is a Munich specialty. It is traditionally only eaten before noon dating back to the time before refrigeration. It is served with sweet mustard and freshly baked pretzels. Another delicious dish to try is Leberkas, a Bavarian baked sausage loaf served with warm German potato salad. Schweinsbraten, pot roast pork, with Knodl, dumplings made from potatoes or white bread, Kraut, cabbage or a Schweinshaxe, pork knuckle are all served for lunch or dinner. For desert is the country's famous Apfelstrudl, apple strudel with vanilla sauce. Just heavenly. Munich is also home and headquarters of the Bayerish Motor Werkes, BMW, and tours of the company and cars is also a great way to spend an afternoon. There are always BMW's on display as you pass the headquarters in the cosmopolitan modern section of Munich. 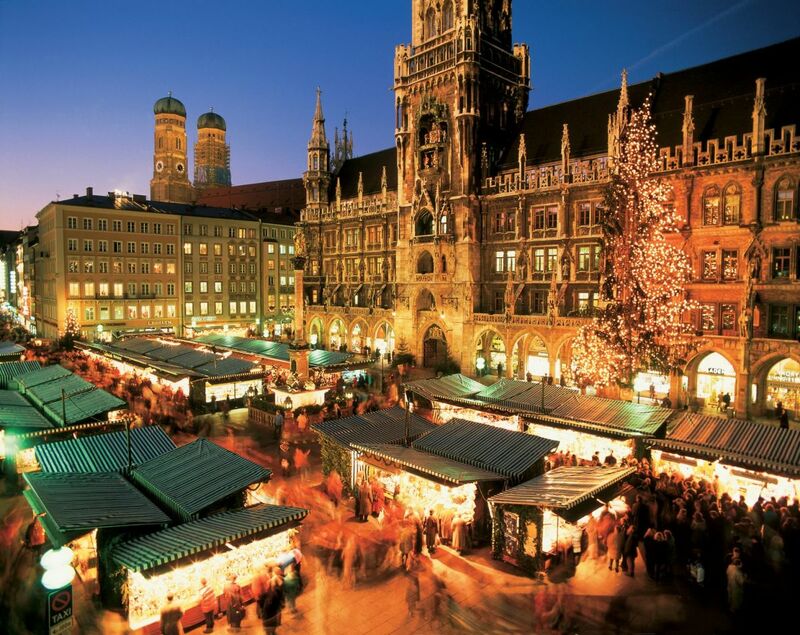 Munich is a thoroughly modern cosmopolitan city that has something for everyone. 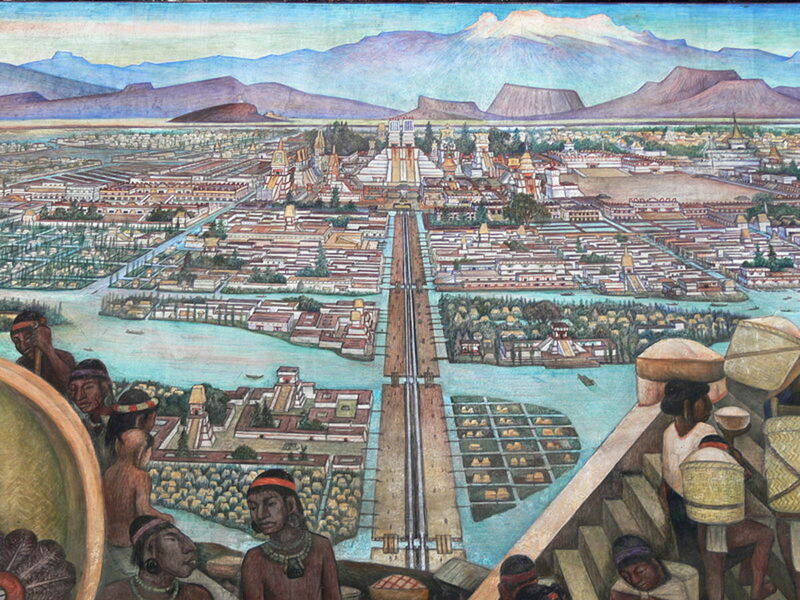 It is smart, interesting, 21st century and yet at the same time traditional and old world. It is the best of both worlds! 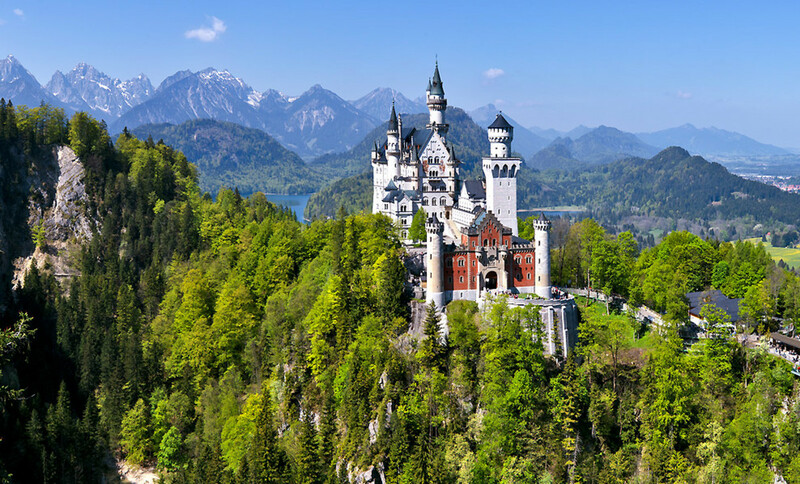 See Neuschwanstein Castle in southern Bavaria in Germany and see one of the world's most famous and popular castles. Learn a little about the life of "Mad" King Ludvig II. German food is delectable and at the same time hearty. But, their pasteries, torts (cakes) pies, cookies, and cream puffs, etc. are delicate and melt in your mouth. A visit or two to a German backerei (bakery) will imbue your senses of smell and taste with so many German goodies. 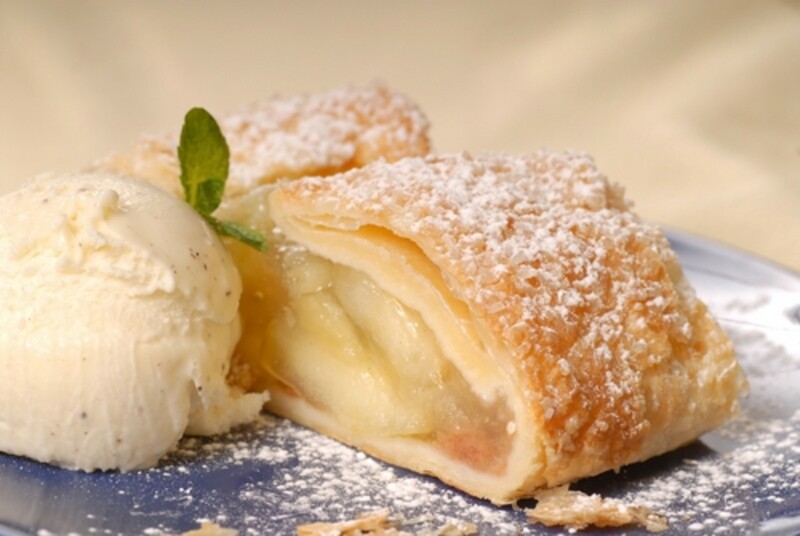 German apple strudel is one of the most popular and famous of all of Germany's desserts. With a flaky crust and tasty apples, this dessert is great for this autumn time of the year. German apple strudel is my favorite of German desserts and although other countries have their own version of apple strudel, German apple strudel is still my favorite. Here is a great German apple strudel recipe that is easy to make. The crust is homemade from scratch and that is part of what makes this dessert to delicious. But, if you need to save time, pre-made pie dough from the store can be used. I prefer the homemade dough, so I have included that here in my recipe. When served, the Germans either serve vanilla ice cream with the strudel or their own vanilla cream sauce. 1. In a large bowl, combine flour, salt, egg, and water and stir vigorously until mixture forms a dough. Turn out onto a floured surface and knead 10 minutes until smooth and elastic. Coverf and let rest for 1 hour. 2. Combine sugar and cinnamon in a medium bowl and mix well; set aside. 3. Preheat oven to 400 degrees F. Grease a 9 x 13" baking dish. 4. Place the dough on a large work surface covered with a cotton cloth. Stretch the dough slightly to form a large rectangle. 5. Pour the melted butter over the dough to moisten. Carefully stretch the dough into a large rectangle as big as your work surface will allow. The dough should be very thin and translucent. 6. Sprinkle the cinnamon mixture evenly over the stretched dough. 7. Distribute the apples evenly over the cinnamon mixture. 8. Roll each side of the dough carefully to the middle and fold the ends under the strudel. Cut the strudel in half and place the two halves side by side in the prepared dish. 9. Bake in preheated oven 1 hour, until golden and apples are tender. I hope you like this recipe as this is one of the easiest of apple strudels to make. Good Luck! Enjoy! Blackspaniel1: So glad you enjoyed reading this. Munich is beautiful and so rich in history and culture. Yes, a boat cruise down any German river is a sight to behold with the ability to visit the villages, towns, and cities along the way. I highly recommend it. I would like to visit. I thing a boat ride on a German river would be the ideal way to go. 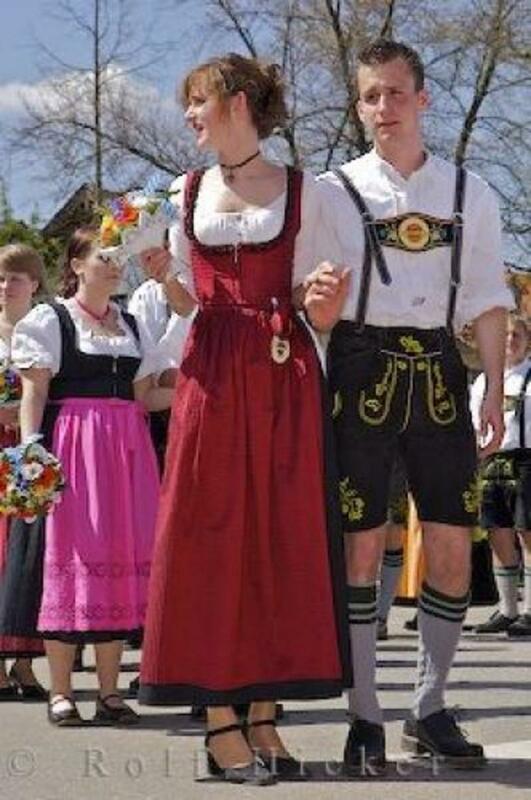 ladyguitarpicker: So, you love Germany, too? It is my favorite country and my home away from home. The entire country is so beautiful and enchanting. The whole country is a fairy tale. Thanks so much for your visit and for your comments. Most appreciated. Great Hub really enjoyed reading about my favorite country. sweetpikez: Thank you so much for reading this and I am glad you enjoyed this. Yes, Munich is one of the most beautiful cities in the world. 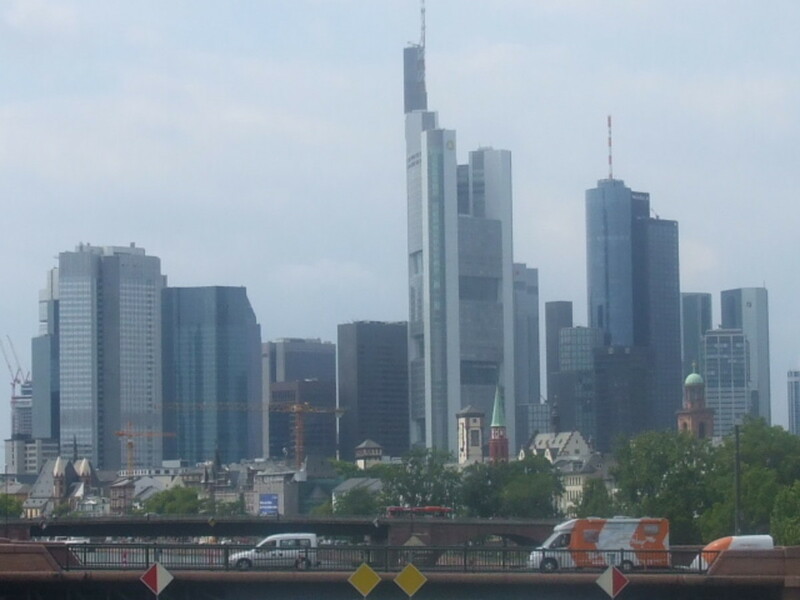 There is so much to see and do there and the German people are so friendly here. I appreciated your visit and your comments. Hi, Suzette. My friend had visited the place several times. She had shown me many beautiful pictures of this place. I was really amazed. Thanks for sharing this hub. I feel like I've been there. Voted Up! Chitrangada: Thanks so much and I am glad you enjoyed reading this. Yes, it is beautiful and there is so much to see and do there. Thanks so much for your kind comments, and the apple strudel is delicious. I appreciate your visit. Much appreciated. Wonderful hub about Munich! My husband has visited this, therefore I have some idea about the beautiful places you have mentioned and I have many photographs as well. Your hubs are always so complete with wealth of information. Your recipe too looks very tempting. Thanks for sharing, voted up! Paula: Thanks so much for reading this and I am pleased you enjoyed it. Munich is a fun and interesting city to explore. I have been there many times and saw a few of these attractions each time. I love the art and architecture of this city, but the Oktoberfest wasn't too bad to experience either. LOL! Thanks so much for your visit. Hi Mike: LOL! Thanks for your comment about Rick Steves. 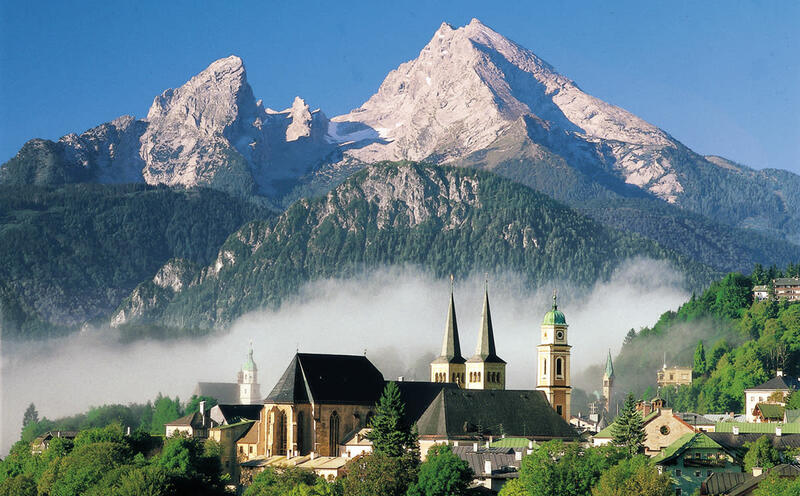 It is a beautiful German city with so much culture and is the epitome of Bavaria. I lived in Wurzburg which is the northern most part of Bavaria, but as you go south you really get a feel for what Bavaria is all about. Thanks so much for reading and I'm glad you enjoyed this. All I can say is 'Move Over Rick Steves' This looks like a grand place. I am not the gypsy in the family. Thank you, Dianna and I am glad you enjoyed reading this. It is a lovely city and so interesting with a culture that is so fun. Just walking or driving by the BMW headquarters, you see the many models on display. It is an interesting place. Thanks so much for your visit. My brother was stationed in Munich during his military service. I remember his postcards and how beautiful the city looked. 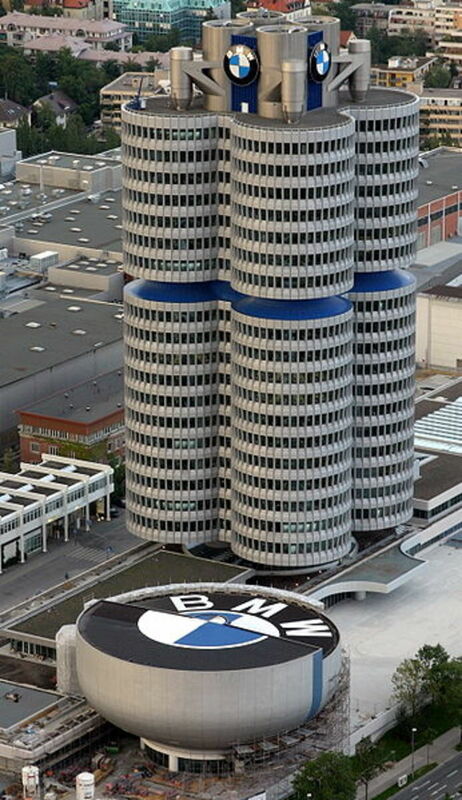 I would love to visit the BMW offices! Thanks for sharing this beautiful city and its history. 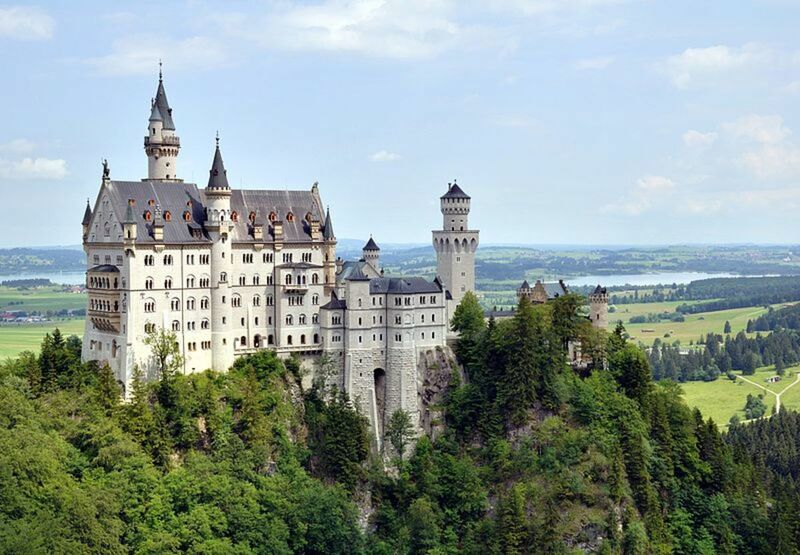 bdegiuliio: You will love Germany and especially Munich and Neuschwanstein. About the chicken dance - that was nearly 30 years ago. LOL! I don't even know if any German's will remember that today. Thanks for your visit. Hi Suzette. Great article on Munich. I have yet to get to Germany but it's on the list. Guess I'll have to brush up on the chicken dance before we go :). Great job. Can't wait to visit the Neuschwanstein castle also. steromike: Nice to hear you have been to Munich. I have been their several times and it is always new to me. There is always something new to see, but the old haunts, like the Hofbrauhaus are fun to go to again and again. You will enjoy Munich no matter how many times you visit. Thanks so much for your comments. Most appreciated. Kim: LOL! You are so funny. I'm with you, a huge piece of apple strudel would just make my day. Thanks so much for reading and I'm glad you enjoyed this. As always- AWESOME! and Shared. I want to see Munich and all of these great places you have brought to us via hub pages. Right now, however, I would like a huge helping of German Apple Strudel. Thanks Bill. I am glad you enjoyed reading this. I hope you get to Europe and experience this wonderful city. If I ever got over to Europe, Munich is on my short list of places to visit. Your article only reinforces that opinion. Great pictures, very interesting.